It's a Blogiversary!! MarieB's Genealogy Blog turns 13!! 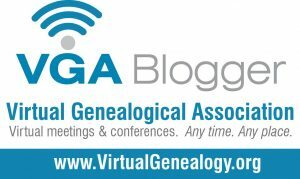 It is hard to believe that it has been 13 years since I started blogging about my genealogy. There have been times when I rarely posted and others in which I posted a great deal. I am thankful I have an outlet to share my excitement about my family history research and things that I've found that have been helpful and maybe at times--things to avoid. Thanks to my readers past, present and future for being part of the journey. I love my research and I love sharing tips and genealogy "happy dance" moments with you. In celebration of the BlogiversaryI thought it might be a good idea to review the top 13 most popular posts of the 13 years! Hope you enjoy and I look forward to sharing many more posts with you! Next let's look at my sister, Rebecca compared to Joy. (You can only do the comparison with tests for which you have admin or editor rights.) Looks like she didn't get that segment from Mom. Compared with Joy she and I share 25.3 cMs across 2 segments. Wait--Mom only had 10.1 cM. Where did I pick up the other 15.2 cMs? Was it a no-call on Mom's test and actually from her side? Did I get it from my Dad? Dad passed before he could test but I have a phased kit of the DNA which I got from him. I could compare my paternal phased DNA if Joy were at GEDmatch. Hopefully she will upload her results there. Now let's take a look at my daughter, Brittany compared to Joy. Looks like she got both segments and would have the potential for passing these segments on to any children she may have. Thoughts: We can't know for sure that the 15.2 cM segment that I have and that I passed on is from my Dad without comparison of the tests results in a Chromosome Browser. Then we can draw some conclusions. Think about it though--Rebecca's two children will not have these segments because she did not have them to pass on to them. That is how sometimes we have different matches than our siblings DNA Randomness. It's no wonder that on average we only match about half of our 4th cousins. Never in my research has there been a better example which illustrates the importance of always clicking thru to view the linked images. If you check the image you will see this is the page on which the census taker, Lula S. Berry is adding all the people that were left out of earlier households. She has the words "Out Of Order" written at the top of the page. It looks like the information to find the households which they were a part of is included in the Location & Household Column along with a note on one of the earlier entries before this grouping that says Information furnished by Ms? Irvine. It is difficult to tell what her system may have been for referencing those households. The snippet I included is of the Record which is linked to Stamped page 261 Sheet 61A. The people ABOVE the blue line are included on the page which is linked to the record. It looks like it was in question whether some infants should have been included or not and the census taker waited til the last to add them. Also the persons who are shown on the record snippet BELOW the blue line and located Two images ahead are guests at the Imperial Hotel in Monterey TN. Always check the image and never blindly add from the record. Additionally, It's a good idea to check at the end of a district to see if there are any persons of interest which were left out of the initial entry and are included at the end of that district. Browsing thru this district which is in order by the stamped page number, you will see that sometimes the sheet number doesn't follow the pattern you would expect it to follow. Always check the image and browse a few pages before and after the entry of interest especially if it doesn't appear to be a standard enumeration. We could blame this on the census taker or the indexer. In my opinion the blame is on us as researchers for not checking more closely. 1940 U.S. census, Putnam County, Tennessee, population schedule, Monterey Town, Enum. Dist: 71-18, p. 261 (stamped), digital image(45 of 48), Ancestry.com (http://www.ancestry.com/ : accessed 20 April 2017); citing NARA microfilm publication T627, roll 3928.
entitled "Your Whiteboard in the Cloud: Trello for Genealogists." You can find this recorded webinar along with others by Lisa in the Legacy Family Tree Webinar library. I'm just getting started using Trello. At this point I am using the Free version. I started by making a Board for my DNA matches. I'm not listing the matches but rather the reoccurring surnames and locations. I think of Lists like the columns for the board and the Cards as the building blocks for that column. You can attach images and links to the Cards you add to the lists. See my first board below. Trello boards also work for collaborating as you can share the boards or if you are more like me you might want them to help you focus on a research task. It reminds me a bit of Bullet Journaling. They are very customizable and there is no wrong way. You decide what works for you and do that. 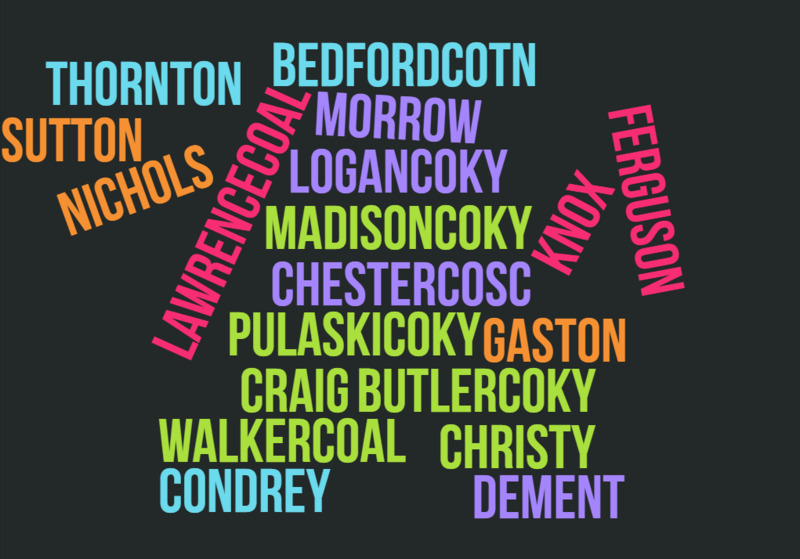 Word clouds are great for bringing together surnames and locations from your research. I use them to pull together groups of people and locations especially when I am working on a DNA segment. You could also do this when researching families that migrated together. In last Wednesday's blog post I asked if anyone wanted to take a guess at how many shared cMs a cousin match at AncestryDNA was estimated by Ancestry to have. The match is kin to me 5 different ways. On reevaluating I found yet another shared Double line. The only person who posted a guess via the comments was Randy Seaver, so regardless, he is the closest. :-) Perhaps the question was intimidating--DNA research can be like that sometimes. Randomness. It doesn't always follow logic or mathematical principles inheritance-wise. for the ones that were thru my PGM's Mom. Typically half of your 4th cousins won't even share DNA with you. Which would put me in really close to Randy's guess. In reality I share 114 cMs across 9 segments as shown below. That is a typical amount for 2nd Cousins once removed. I should also note that the 114 cMs made it thru the Ancestry "cut" so it doesn't include anything that is in what they consider to be a "pile-up" region. Ancestry matches will not include X Segments so there may still be more in common along the X where it is in the x inheritance path. In typically fashion my sister has done it again and matched them more. The match shares 132 cMs with her across 7 segments. I really need to see this match at GEDmatch. I think this is a great exercise in how large segments are passed. In my daughter's matches there are many of the Wildes/Wilkinson descendants who share a large segment of 50 cMs on one chromosome. Randomness for sure! Care to guess the AncestryDNA estimated shared amount of cMs? The DNA match(at AncestryDNA) that is related to me 5 different ways(all on my Dad's side) responded after a 2 year wait. Never lose hope. People get busy and have other priorities outside of genealogy---shocking--isn't it? Here are all 4 connections paths with the Frizzell / Deason line being double for me so in essence 5 ways. Want to hazard a guess at the Ancestry predicted shared amount of cMs? Hopefully I will be able to see the amounts at GEDmatch soon and see what, if any, segments were excluded from that Ancestry estimate. Also even with the intermarriage between these families I think I may be able to identify the difference in the segments. There are several testers who have the Frizzell/Deason lines exclusively, two with Morrow/Frizzell. * my 4th Greats thru two lines. In my morning phone call with my Mom, she mentioned that today was the day that Little Kathy Fiscus (her Find a Grave memorial) fell in the well in San Marino, California.. The year was 1949 and Mom was 8 years old. She remembers listening to the news about it on the radio. The Wikipedia article tells a bit more about the rescue attempt. This reminded me a bit of Jessica McClure who fell in a well in Texas the year after I graduated high school. It is interesting the things that stick in our memories. FTDNA launched MyOrigins 2.0 today. Mine results are shown below along with my ethnicity reports according to DNALand, and AncestryDNA. MyHeritage has promised to make it's full Ethnicity report available free to all those who have uploaded their raw data(I've uploaded 4 tests) there from any of the other sites. This and the coming of a chromosome browser, and downloadable matches were mentioned in the MyHeritage Webinar that was made available for free at Legacy's FamilyTreeWebinar site last week. The two biggest changes from the earlier version were the increase in Scandinavian(decrease in West/Central Europe) and the addition of 4% Sephardic Jew. I've never had ANY Jewish amount even traces in any of my other tests results, so that was interesting to see. There are many other Admixture tools at GEDmatch that you may use once you upload. I chose this one because I thought it would be the most accurate for my lineage. I think we can all agree that I'm mostly European. :-) In my opinion, being able to validly interpret a person's Ethnic mix using their DNA data is still in the infancy stage.